The Canon 100mm f/2.8L Macro is a surprisingly sharp lens with one killer feature: image stabilization. For handheld macro work, there is nothing that compares. Although the plastic body of this lens will turn away some photographers from choosing this lens, others will enjoy the lighter weight. And even though this lens is cased in a plastic body, it is still quite sturdy and is weather sealed. On a full-frame camera, some photographers will find the focal length of this lens too short, and will instead choose the 180mm macro, which is slower to focus, more expensive, and older, but which still performs well. Who Should Buy this lens: Macro photographers who want a dedicated macro lens rather than using extension tubes or a close focus filter, and who will use the lens handheld to take advantage of the image stabilization. The Canon 100mm f/2.8L Macro is one of the best choices for macro photographers, but it isn't the only choice. If you find yourself shooting macro photography handheld, this is undoubtedly the choice for you; however, if you shoot from a tripod or use a macro rail for your macro photography, then there are better options available since the image stabilization won't really help you. Sharpness: Sharp? Absolutely. Really sharp? That too. Gouge out my eyeballs sharp? Nah. They're okay. Vignetting: Only when wide open, and even then it isn't severe. Color: On par with other lenses of similar quality. No negatives to mention. Contrast: On par with other lenses of similar quality. No negatives to mention. Chromatic aberration: On par with other lenses of similar quality. Not surprisingly, SLR Gear notes the CA is worse at higher f-stops. Flare: The aperture has 8 blades, so it should produce a nice star effect when stopped down to around f/9. I have not tested the way the sun comes through the glass to determine how that looks. This lens is capable of true 1:1 macro photography. This means that the subject of the photo can be reproduced on the image sensor at actual size. So if you take a picture of an ant, the ant will be ant-size on the imaging sensor. That isn't to say that the ant will be tiny in the picture. Since the imaging sensor is quite small, the ant will appear quite large in the photo. If you are buying a dedicated macro lens, you'll certainly want at least a true 1:1 like this lens. Many lens manufacturers advertise that a lens is “macro” when it has a reasonably close focus distance, but it isn't anywhere near 1:1. So be sure to check the magnification ratio when looking at other alternatives to this lens. The close focus distance for this lens is .99 feet (.3 meters), which gives just enough room between you and the subject to make photography practical, while still maximizing the macro capabilities of the lens. But if you read the manual for this lens on page 11, you find a little catch. Here it is: “The shorter the subject distance from the camera, the lesser the image stabilization effect will be.” That's quite significant because you will usually use this lens with a short subject-to-lens distance (I mean… after all… it IS a macro lens…). So when using this lens as it normally would be used, the image stabilization is less effective. How much less? About two stops according to most who have tested it. So now this begs an important question. You can buy this lens rather than the older version of this lens (that is just as sharp but doesn't have the IS) for a lot less money and since the IS is only about two stops for most macro conditions, there would be a good argument to save your money. To be fair, this limitation is not unique to this lens. It is normal for image stabilization to work less well when the subject-to-lens distance is short. But since this is one of few macro lenses with image stabilization, the limitation is exacerbated. When shooting macro, photographers generally like a longer distance from the subject to the lens so that the shadow from the photographer and lens don't throw shadows on the subject. Also, when shooting small insects, getting too close can scare them away. However, if you shoot this lens on a crop sensor camera, it ends up being just right. The crop effect will make this lens shoot like a 160mm lens (35mm equivalent). Another consideration is how focal length affects depth of field. If all else is equal, a longer focal length will produce shallower depth of field. So while it's more convenient to shoot macro photography from further away, using a longer focal length macro (like the Canon 180 macro) will produce shallower depth of field. That's the opposite of what macro photographers want. Macro photographers usually fight to get as much depth of field as possible so that the entire subject is in sharp focus. So there are benefits and drawbacks to shooting the 100mm focal length. It really depends on whether you want to be further back to shoot wary insects or to keep from throwing shadows, or if you like the 100mm focal length to maximize your depth of field. While this lens is rarely purchased for the intention of using it predominantly for portraiture, this lens is quite capable as a portrait lens as well. 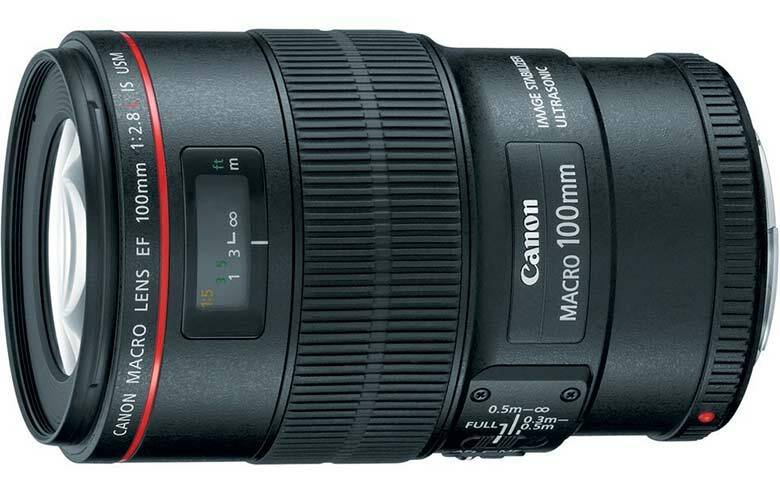 In fact, I know some wedding photographers who always pack a Canon 100mm f/2.8L Macro so they can get detail photos of the wedding decorations, shots of the bride's ring, etc. Then they have the lens do double duty as a fast portrait lens as well. For wedding photographers who want a little wider variety in their photos, this is an excellent choice. Works perfectly on any Canon DSLR–both a full-frame (EF) or a crop-sensor (EF-S) camera. In fact, I love this lens on a crop sensor camera because I feel that the 160mm effective focal length is more useful. The lens has a focus motor built-in, so it will work marvelously on any Canon DSLR. This is an odd lens in many ways, and the build quality is part of that. This is an L series lens, so it is weather sealed and built well; however, it's built out of plastic. A all-plastic lens means the lens is far less durable than a metal body, which is less susceptible to damaging the delicate optics when bumped. Actually, I misspoke. The lens isn't all plastic. Chuck Westfall (the Camera Evangelist for Canon) points out, “The focus ring, lens mount and name plate are made from aluminum, and other parts are basically made with engineering plastic.” So there you have it. You can sleep well tonight knowing that the $1,000 lens has an aluminum name plate. Not only is the body of the lens made of the plastic, the filter thread is as well. This is the part that really annoys me. It's easy for photographers to get a little too excited and overtighten a filter, and if you do that with a plastic thread, you're likely to strip the rings or make it nearly impossible to get the filter off. We've all been there. On an L-series lens costing around $1,000, this is unacceptable in my book. But you'll immediately see when using the lens that, although plastic, it's a very high grade plastic. Also, you'll notice the other finishes which are hallmarks of well-built lenses, such as flush-mounted switches so they don't get bumped accidentally and a focus scale. When shooting macro, you'll often find yourself manually focusing to focus stack or other adjustments. The focus ring on this lens tends to be a bit too snappy, making it difficult to dial in the exact perfect focus. Especially on a macro lens, it makes more sense to have the focus ring be a bit less touchy. While on the subject of the manual focus ring, which is normally of little consequence but in a macro lens gets extra attention, there is a significant amount of focus breathing apparent when using this lens. What's that? It means by changing the focus, the lens also changes the focal length slightly. Lens manufacturers do their best to minimize this, but it is a problem, and in this lens it is moderate. Again, on a macro lens, that is a significant consideration. Some users find that the supplied ET-67 lens hood can rattle a bit and does not fit tightly on the lens as it should. Also, given the 100mm focal length which will often put your lens quite close to the subject, you may find that the standard lens hood is too long and throws shadows on the subject. The good news? You can unscrew it 🙂 Other good news? The lens hood has plastic texturing, which will make you a much better photographer (okay, I'll stop with the sarcasm). Given that this lens is made of plastic, it's fairly light and easy to work with. The lens weighs 625 grams (compared to 505 grams for the Sony 100mm f/2.8 Macro). To put that in real terms, it weighs about the same as an iPad 4. This was the first lens Canon released which included hybrid image stabilization. This new technology corrects not only for the angle of the lens moving, but also the vertical and horizontal shifts. This later became a standard for image stabilization in Canon's higher end lenses. The image stabilization in this lens is excellent and if image stabilization is an important feature to how you'll use the lens, then this is certainly the lens for you. However, because this was the first with this type of image stabilization, there are a few oddities to note. Some reviewers find that the image stabilization makes strange noises while in use. You can check the current price of this lens on Amazon. For an L-series lens, this is a reasonable price; however, the question is if it is reasonable when compared to other comparable lenses. Most professional macro photographers would probably choose the 180mm macro for a little more money, and most casual macro photographers would simply buy extension tubes or a close focus filter. If you find yourself somewhere between the two, then this is an exceptional lens at a reasonable price. Roger Cicala notes that the lens is quite sharp and if you need the image stabilization, is worth the price. 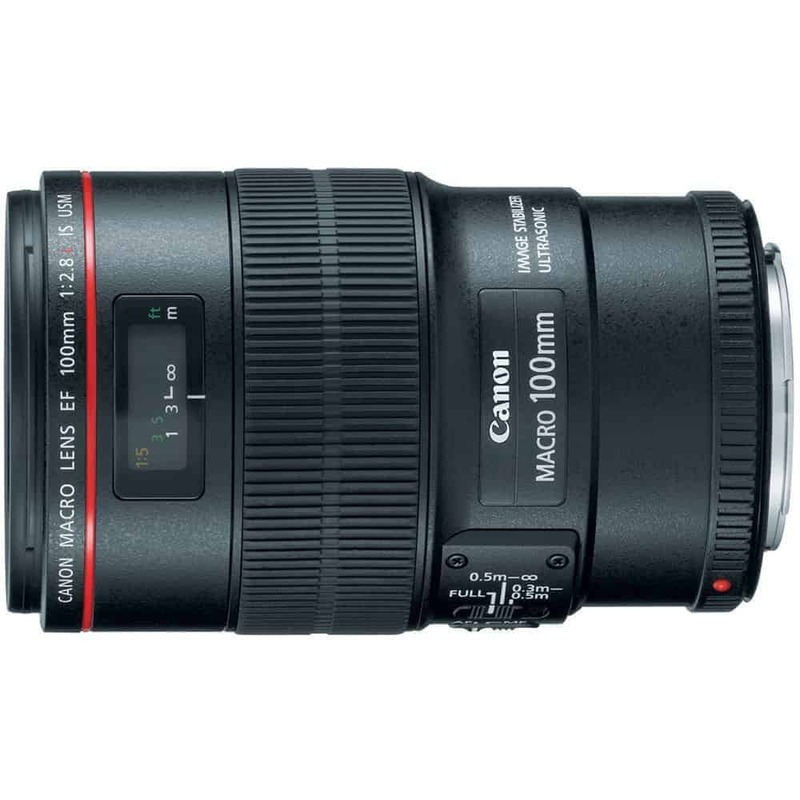 If you don't need the Image stabilization, he recommends choosing the older version of this lens (the 100mm f/2.8 macro. Non “L”). Ken Rockwell notes that this lens does very well when focused up close, but loses sharpness quickly when focused to infinity. That's a significant problem if you plan on using this as a portrait lens. DPReview calls this lens one of the finest lenses they've ever tested–and that's saying something! Bryan Carnathan says the 180mm macro is the better option for professional macro photographers, but it is also slow to focus and more expensive. What do all the acronyms mean in the lens name? EF means this lens will work on a full frame (EF) or a crop sensor (EF-S) camera. f/2.8 means this lens has a constant aperture of f/2.8. The highest aperture this lens can achieve is f/22. L is Canon's marketing term for its professional grade lenses. These lenses are usually (but NOT always) a whitish cream color. IS means this lens has image stabilization technology built in. That's excellent for low light shooting. USM means this lens has an ultrasonic motor built-in. This means the lens will focus quickly and with little noise.